Senior socialist leader and Rajya Sabha MP Sharad Yadav on Saturday questioned the Election Commission's decision to grant the "Arrow" symbol to the Nitish Kumar-led faction. 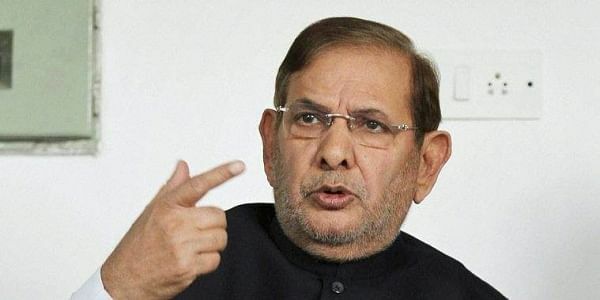 NEW DELHI: Senior socialist leader and Rajya Sabha MP Sharad Yadav on Saturday questioned the Election Commission's decision to grant the "Arrow" symbol to the Nitish Kumar-led faction of Janata Dal-United and vowed to fight it both legally and democratically. "The decision has not meted out justice. The EC's decision is just asking the person who built the building to vacate it. My lawyers are looking into the matter and will soon take a call. Our fight will continue," Yadav told reporters here at a press conference. He was responding to the Commission's decision in which it granted the "Arrow" symbol to the Nitish Kumar-faction after a three-month battle between the two warring factions of the JD-U. Yadav, a former President of the JD-U, said the EC's decision would not deter his fight to "save democracy". "We are not dismayed with this decision. We knew the fate but it does not mean that we should end our fight. Our fight for party symbol is a legal battle but the real issue, for which we are fighting, is to save democracy. "The country runs on issues and on principles. They (Nitish-led faction) have insulted the mandate of 11 crore people of Bihar by joining hands with BJP. "They have compromised with the issues and principles. We will continue our democratic fight," he said. Hinting that he could form a party in the future, Yadav said he has held discussions with Congress and his candidates would fight the Gujarat Assembly polls on "auto rickshaw" symbol. "Talks have been completed. The Congress is a driving force in Gujarat and it would declare the seats and candidates," he said. The Yadav-led faction of the JD-U is contesting the Gujarat elections under Chhotubhai Vasava's leadership. On being asked about the ramification of the EC decision regarding his disqualification case, which is pending before Rajya Sabha Chairman M. Venkaiah Naidu, Yadav said: "There would be difficulties when you fight for the cause of democracy but I never bowed before anyone. You can see my biodata. I have devoted my long life to politics but I never compromised on principles." Javed Raza, who is considered close to Sharad Yadav, said they are reviewing the EC order in detail and would soon decide the future course of action in consultation with their lawyers. "We do have the option of knocking the door of the High Court," he said.